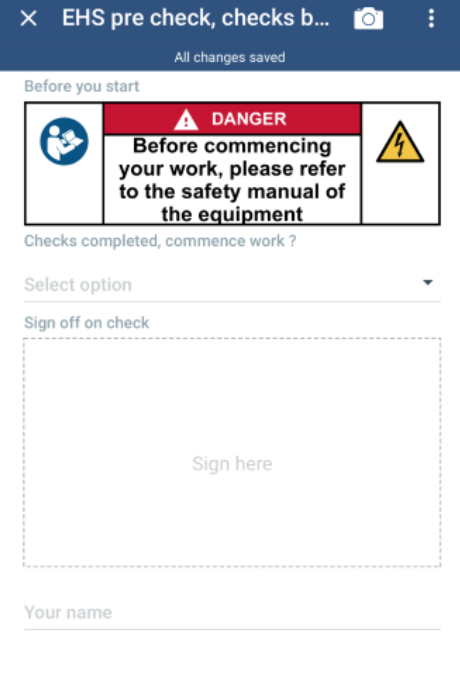 Increase Safety in Field Service Our new Safety checklist element allows you to add ISO-7010-based safety labels to your smartforms, helping communicate workplace conditions and hazards to technicians. Are words like “Service Call” and “Activities” misleading for your company and business case? Would you would prefer to use the your own terminology, for example “Service Order” or “Operation”? You can now view all the translation keys contained in the web applications and add your custom, company-specific translations using the Translations feature in the Admin application. Starting with this release, customers can reschedule unreleased service appointments themselves–without needing to call a hotline or wait for opening hours. You can now filter the Activity List using the workflow step. For example, if you wanted to have an overview of all currently scheduled activities that have been rejected by the technician, you could apply the Workflow Step filter with “reject” selected. You would then be able to quickly replan these activities. Copying text between different systems is now easy thanks to the Copy function available on Planning List and Activity List. Simply right-click on the Planning List or use CTRL+C on the Activity List to select and copy the text to the clipboard. 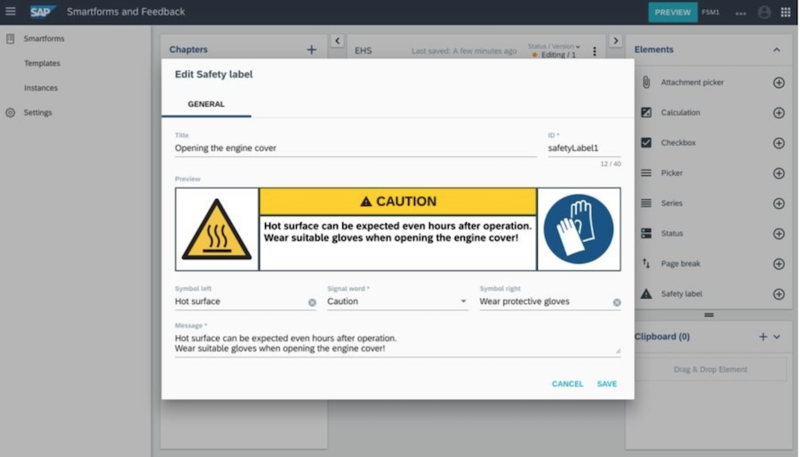 Our new Safety checklist element allows you to add ISO-7010-based safety labels to your smartforms, helping communicate workplace conditions and hazards to technicians. We’ve made it a lot easier for you to manage your smartform categories. Creating a new category can be done by using the plus button located at the bottom-right. Additionally, you can also quickly edit or delete smarform categories as needed. With the search functionality available in the Service Map, you can now see where your technicians are located (Technician search) as well as which technician is closest to a given location (Location search) to further improve planning activities. Simply use the dropdown to switch between “Location search” and “Technician search” as needed. To ensure that the service partner provides a professional service to the end-customer, the crowd owner can now differentiate each partner’s abilities by using skills, which are then matched to the end-customer requirements. The crowd owner can now review a partner’s skills on demand. For example, if the service partner adds an additional certification, the crowd owner can add a new skill to the partner so that they are eligible to be assigned corresponding jobs. Additionally, if the partner’s certification has expired, the crowd owner can easily remove the skill from the partner and they will no longer be assigned jobs with the requirement. The crowd owner can now customize different types of emails the crow partner receives in order to improve coordination and communication. Customizable emails include: partner invitation email, partner sign-up email, job assignment email, service rating email, among others. The Crowd Platform Sign-Up view can now be customized with the crowd owner branding. 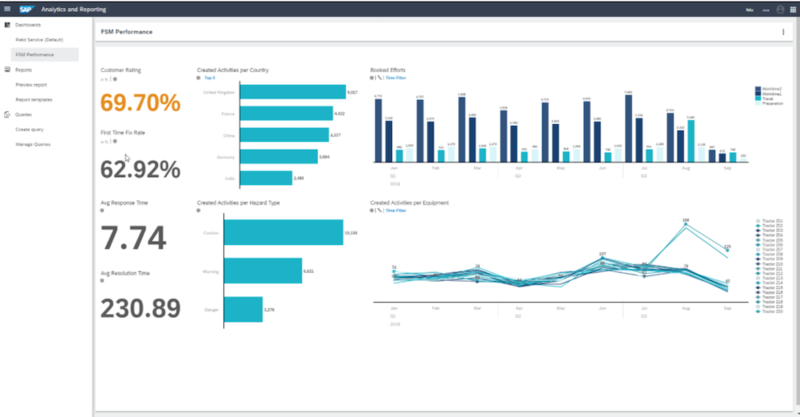 The stories created in SAP Analytics Cloud with the data exported through the OData Service can now be embedded within the Analytics and Reporting app. for viewing, that you do not have to switch between different applications. Would you like to upload large amount of objects but you find the Data API unsuitable for mass uploads and the Batch API complex to use? With the Bulk API, you now have a simple API that rests on top of the Data API and allows you to upload tables of objects with a single HTTP call. Are you integrating with SAP Field Service Management and want to create a Service Call via an API? 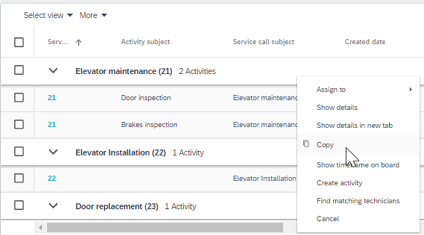 The Service API now supports the creation of a Service Call with multiple activities and multiple reserved materials. Reserved materials can be created for either a service call or an activity. 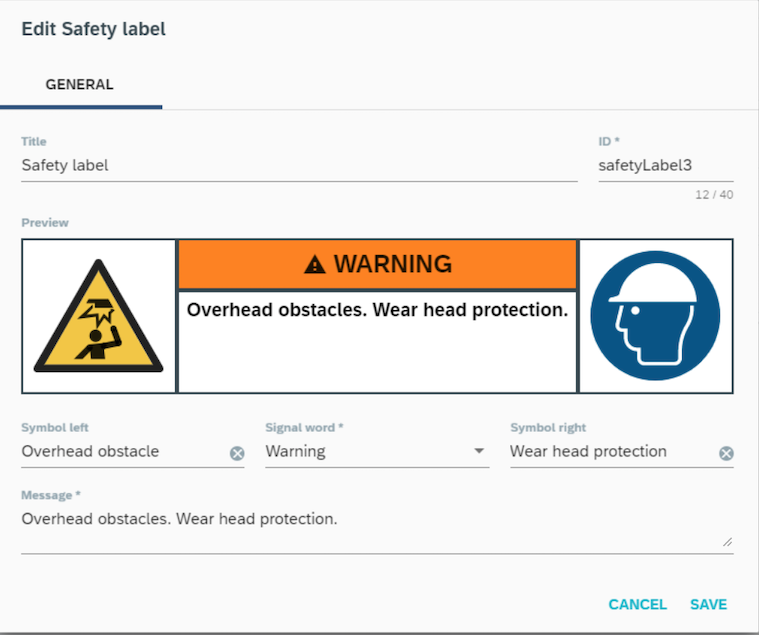 You can now add ISO-7010 based safety labels in Smart forms which will then be displayed to your fields service workers in smartforms. View past assignments carried out on an equipment, providing field service technicians a better overview of an equipment’s history. Your service technicians can now use the Windows client to create a service assignment on the go. Interested in seeing what`s available in Preview for SAP Field Service Management? Interested in being notified about SAP Field Service Management information relevant to you?